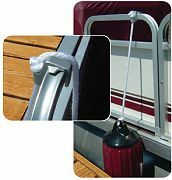 Finally, a fender adjuster designed specifically for the 1" square tube rails of Pontoon Boats. The mounting structure clamps securely to square tubing yet can be repositioned quickly and easily. Constructed from durable ABS plastic this fender adjuster allows for simple height adjustment for lines up to 3/8"